The bench then observed: “In view of the aforesaid enunciation of law and on consideration of the provisions contained in Standing order in the facts and circumstances of the case, we are of the opinion that appellant has rightly terminated the relationship by serving the requisite notice for resignation. To resign is a right of an employee who cannot be forced to serve in case he is not willing until and unless there is some stipulation in the rules or in the terms of appointment or disciplinary proceedings is pending or contemplated which is sought to be avoided by resigning from the services. The appellant is aggrieved by the judgment and order dated 7.9.2010 passed by the High Court of Bombay, dismissing Writ Petition No.1740 of 2010. The question arises whether the appellant ceased to be an employee of the respondent on 1st October 2006 since he had resigned on 1.9.2006 as 30 days period came to an end on the aforesaid date. The appellant joined the services of Air India Ltd. as Assistant Aircraft Engineer in Major Maintenance Division of Engineering Department w.e.f. 1.9.1992. As per the terms and conditions, he was required to serve Air India for a minimum period of five years, as per the condition stipulated in the letter of his appointment. As on the date he resigned, he had completed five years of service. The Certified Standing Orders framed under the Certifying Officer Under Industrial Employment (Standing Orders) Act, 1946 (in short “The Act of 1946”) as introduced in Air India Ltd. and as applicable to the establishment, required the employer to define the terms and the conditions of service applicable to a workmen and inform him of the same. The Certified Standing Order, inter alia, deals with the conditions under which an employee can tender his resignation. He is entitled to receive the certificate of service rendered at the time of cessation of his employment. The Certified Standing Order confers a right on the employer under the Act of 1946 not to accept the resignation if at the relevant time of his resignation any disciplinary action is pending or is contemplated. As per the case set up by the employee, Certified Standing Order prescribes that an employee can leave the service by serving 30 days' notice or paying the sum equal to 30 days wages. The question of acceptance arises in a case of a shorter notice, for resignation where the question of payment of wages as involved. The resignation is effective after 30 days even without its acceptance. The appellant served notice for resignation on 1.9.2006 to take effect from 1.10.2006, precisely on expiry of 30 days' period. There was no right available with the Air India Ltd. to decline to accept the resignation as informed vide communication dated 20.9.2006. After resigning, there was cessation of employment with the Air India Ltd. The appellant then joined Jet Airways on 3.10.2006. He approached the Air India to release his pending dues, provident fund, gratuity, and unpaid wages. Air India Ltd. issued a letter dated 16.7.2008 to the effect that since his resignation had not been accepted, he was asked to report for duty. The appellant raised the grievance in the centralized grievance cell and served a reminder for payment of the dues. Ultimately, the appellant filed writ application in the High Court of Bombay on 23rd July 2010 which had been dismissed. Consequently, the appeal has been filed in this Court. It was urged by the learned counsel appearing on behalf of the appellant that there was no necessity of acceptance of resignation under Standing Order 18 framed under the Act of 1946. By virtue of the provisions contained in Standing Orders, 30 days’ notice has to be given or wages in lieu of the notice period has to be paid by a permanent workman. He has relied upon the decisions in Punjab National Bank v. P.K. Mittal (1989) Supp. (2) SCC 175, State of U.P. v. Achal Singh (2018) 10 SCALE 89, and Dinesh Chandra Sangma v. State of Assam. (1977) 4 SCC 441. On the other hand, learned counsel appearing on behalf of the respondent has relied upon the decision of this Court in Moti Ram v. Param Dev and Anr. (1993) 2 SCC 725 to contend that acceptance of resignation was necessary. (a) Of a permanent workman by giving 30 days notice in writing or wages in lieu of notice. (b) Of a workman on probation by giving 7 days notice by giving 24 hours notice in writing or wages/stipend in lieu of notice. (c) Of a temporary workman including apprentice by giving 24 hours notice in writing or wages/stipend in lieu of notice. (d) of badli or substitute without notice or wages in lieu of notice. (ii) No notice is necessary for terminating the service of a workman employed for a specified period at the end of that period. (iii) No notice is necessary for terminating the services of a casual or part-time workman. (iv) A workman who is absent without permission for a period of ten days or more will be deemed to have voluntarily abandoned the services of the Company. For the purpose of this Standing Order, the word “Wages” shall include all emoluments which would be admissible, if the workman was on privilege leave. (i) No workman shall resign from the service of the Company except by giving such notice as he would have received under Standing Order 17 if his services were to be terminated, or compensation in lieu of such notice, unless, at the request of the workman, the notice is waived or shorter notice accepted in writing by the Competent Authority. Such compensation shall be equivalent to the amount of the wages as defined in the explanation to Standing Order 17 which the workman would have drawn during the period by which the notice falls short of the prescribed period, and shall be deemed to be a liability owed to the company for the purpose of Regulation 22 (2) of the Air India Employees Provident fund Regulations, 1954. (ii) A resignation given under (I) above may be accepted with immediate effect or at any time before the expiry of the period of notice, in which case the workman shall be paid his wages in respect of the entire period of notice given by him. (iii) In case of shorter period of notice is accepted at the request of the workmen, he shall be entitled to receive his wages only for the actual number of days worked. (iv) If a workman leaves the service of the Company without giving any notice or by giving inadequate notice, such resignation shall be liable to be construed as misconduct and may entail any of the punishments prescribed under Standing Order 20. (v) Notwithstanding anything contained in clause (I) and (iii) above, a workman shall not be entitled to tender his resignation and any resignation tendered by him shall not be effective or operative against the company, unless the company decides to accept the resignation, if, at the time when such resignation is tendered, disciplinary action is pending against him or is intended or proposed to be taken against him by the appropriate authority." It is apparent from a bare reading of the provisions contained in Standing Order 18 that workman has a right to resign from the services by giving a notice of the period as prescribed under Standing Order 17 which provides termination of services by serving 30 days notice upon a permanent workmen and seven days notice with respect to workman who is on probation and temporary workman by serving a 24 hours notice. Thus, for a permanent employee, a period of 30 days is provided to terminate or to resign as apparent from a conjoint reading of provisions of Standing Orders 17 and 18. Clause 2 of Standing Order 18 provides that in case of resignation is with immediate effect or any time before the expiry of notice period, acceptance of resignation is required. Acceptance is not required in case a notice has been given of 30 days. It is right of a workman to serve and resignation tendered by him shall be effective or operative with exception, if at the time when such resignation is tendered, disciplinary action is pending against him or is intended or proposed to be taken against him by the appropriate authority, unless the company decides to accept the resignation. In our opinion, from a bare reading of the provisions contained in Standing order 18, it is crystal clear that a permanent employee has a right to resign from the services by giving a notice of the period of 30 days as prescribed under Standing Order 17, and is entitled to obtain certificate from the employer for the period services have been rendered. Clause 2 of the Standing Order 18 provides that in case of resignation is submitted with immediate effect or any time before the expiry of notice period, acceptance is necessary. Acceptance of resignation is not required in case a notice has been given of 30 days. It would be operative and effective on the lapse of the period. It is right of a workman to serve an employer and to resign also by serving notice of 30 days. The bond to serve was only for five years as stipulated in the order of his appointment. The period of bond to serve was admittedly over. There is no other Standing Order or rule which puts a fetter on an employee to resign or confers power on the employer to reject a resignation. “5. We have given careful thought to this contention of the learned counsel and we are of the opinion that the High Court was right in the conclusion it reached. Clause (2) of regulation 20 makes it incumbent on an officer of the bank, before resigning, to serve a notice in writing of such proposed resignation and the clause also makes it clear that the resignation will not be effective otherwise than on the expiry of three months from the service of such notice. There are two ways of interpreting this clause. One is that the resignation of an employee from service is a voluntary act on the part of an employee, he is entitled to choose the date with effect from which his resignation would be effective and give a notice to the employer accordingly. The only restriction is that the proposed date should not be less than three months from the date on which the notice is given of the proposed resignation. On this interpretation, the letter dated 21st January 1986 sent by the employee fully complied with the terms of this clause. Though the letter was written in January 1986 the employee gave more than three clear months' notice and stated that he wished to resign with effect from June 30, 1986, and so the resignation would have become effective only on that date. The other interpretation is that, when an employee gives a notice of resignation, it becomes effective on the expiry of three months from the date thereof. On this interpretation, the respondent's resignation would have taken effect on or about 21.4.1986 even though he had mentioned a later date. In either view of the matter, the respondent's resignation did not become effective till 21.4.1986 or 30.6.1986. It would have normally automatically taken effect on either of those dates as there is no provision for any acceptance or rejection of the resignation by the employer, as is to be found in other rules, such as the Government Services Conduct Rules. 6. Much reliance was placed on the terms of the proviso to clause (2) of regulation 20 to justify the action of the bank in terminating the respondent's services earlier but we do not think that the proviso can be interpreted in the manner suggested by learned counsel for the bank. The resignation letter of the officer has to give at least three months' advance notice under the main part of the clause. What the proviso contemplates is that in a case where the employee desires that his resignation should be effective even before the expiry, of the period of three months or without notice being given by him, the bank may consider such a request and waive the period or requirement of notice if it considers it fit to do so. That question does not arise in the present case because the employee had not requested the bank to reduce the period of notice or to waive the requirement of notice. Dr. Anand Prakash seeks to interpret the proviso as empowering the bank, even without any request on the part of the employee, to reduce the period or waive the requirement of notice. In other words, he says the bank has the power to accept the resignation with immediate effect even though the notice is only of a proposed future resignation. We do not think this contention can be accepted. As we have already mentioned, resignation is a voluntary act of an employee. He may choose to resign with immediate effect or with a notice of less than three months if the bank agrees to the same. He may also resign at a future date on the expiry, or beyond the period, of three months but for this no further consent of the bank is necessary. The acceptance of the argument of Dr. Ananad Prakash would mean that, even though an employee might express a desire to resign from a future date, the resignation can be accepted, even without his wishes, from an earlier date. This would not be the acceptance of a resignation in the terms in which it is offered. It amounts really to forcing a date of termination on the employee other than the one he is entitled to choose under the regulations. As rightly pointed out by the High Court, the termination of service under clause (2) becomes effective at the instance of the employee and the services of the employee cannot be terminated by the employer under this clause." Para 13: In our opinion, whether voluntary retirement is automatic or an order is required to be passed would depend upon the phraseology used in a particular rule under which retirement is to be ordered or voluntary retirement is sought. The factual position of each and every case has to be seen along with applicable rules while applying a dictum of the Court interpreting any other rule it should be Pari Materia. Rule 56(2) deals with the satisfaction of the Government to require a Government servant to retire in the public interest. For the purpose, the Government may consider any material relating to Government servant and may requisition any report from the Vigilance establishment. 15. It is a cardinal rule of construction that no word should be considered redundant or surplus in interpreting the provisions of a statute or of a rule Explanation 2 does not say an express or implied term of employment but refers to "an express or implied term of his contract of employment". If the language in Explanation 2 were different, namely, an express or implied term of employment, instead of "contract of employment", the position would have been different. Explanation 2 in Rule 119 albeit a penal rule takes care to use the words contract of employment" and necessarily excludes the two categories of employment, namely, the one under the Central Government and the other under the State Government. Explanation 2 only takes in its sweep the third category of employment where the relationship between the employer and the employee is one governed by a contract of employment. Since FR 56 is a statutory condition of service which operates in law, without reference to a contract of employment, there is nothing inconsistent between Rule 119 and FR 56. 16. The appellant has voluntarily retired by giving three months' notice not in accordance with an express or implied term of his contract of employment, but in pursuance of a statutory rule. Explanation 2 to Rule 119 makes no mention of retirement under a statutory rule and hence the same is clearly out of the way. The submission that rule 119 is superimposed on F.R.56 has no force in this case. 17. The High Court committed an error of law holding that consent of the Government was necessary to give legal effect to the voluntary retirement of the appellant under F.R.56(c). Since the conditions of FR 56(c) are fulfilled, in the instant case, the appellant must be held to have lawfully retired as notified by him with effect from 2nd August 1976. In view of the aforesaid enunciation of law and on consideration of the provisions contained in Standing order 18 in the facts and circumstances of the case, we are of the opinion that appellant has rightly terminated the relationship by serving the requisite notice for resignation. To resign is a right of an employee who cannot be forced to serve in case he is not willing until and unless there is some stipulation in the rules or in the terms of appointment or disciplinary proceedings is pending or contemplated which is sought to be avoided by resigning from the services. Thus, we are of the opinion that the High Court has erred in law in holding otherwise. 16. As pointed out by this Court, 'resignation' means the spontaneous relinquishment of one's own right and in relation to an office, it connotes the act of giving up or relinquishing the office. It has been held that in the general juristic sense, in order to constitute a complete and operative resignation there must be the intention to give up or relinquish the office and the concomitant act of its relinquishment. It has also been observed that the act of relinquishment may take different forms or assume a unilateral or bilateral character, depending on the nature of the office and the conditions governing it. 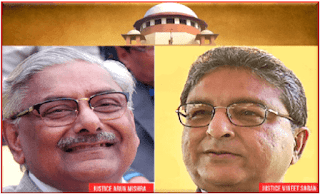 Union of India v. Shri Gopal Chandra Misra & Ors.,  3 SCR 12 at p. 21). If the act of relinquishment is of unilateral character, it comes into effect when such act indicating the intention to relinquish the office is communicated to the competent authority. The authority to whom the act of relinquishment is communicated is not required to take any action and the relinquishment takes effect from the date of such communication where the resignation is intended to operate in praesenti. A resignation may also be prospective to be operative from a future date and in that event, it would take effect from the date indicated therein and not from the date of communication. In cases where the act of relinquishment is of a bilateral character, the communication of the intention to relinquish, by itself, would not be sufficient to result in relinquishment of the office and some action is required to be taken on such communication of the intention to relinquish, e.g., acceptance of the said request to relinquish the office, and in such a case the relinquishment does not become effective or operative till such action is taken. As to whether the act of relinquishment of an office is unilateral or bilateral in character would depend upon the nature of the office and conditions governing it. 18. A contract of employment, however, stands on a different footing wherein the act of relinquishment is of bilateral character and resignation of an employee is effective only on acceptance of the same by the employer. Insofar as Government employees are concerned, there are specific provisions in the service rules which require acceptance of the resignation before it becomes effective. In Raj Kumar v. Union of India,  3 SCR 857, it has been held "But when a public servant has invited by his letter of resignation determination of his employment, his services normally stand terminated from the date on which the letter of resignation is accepted by the appropriate authority, and in the absence of any law or rule governing the conditions of his service to the contrary, it will not be open to the public servant to withdraw his resignation after it is accepted by the appropriate authority. Till the resignation is accepted by the appropriate authority in consonance with the rules governing the acceptance, the public servant concerned has locus poenitentiae but not thereafter". Relying on said decisions, the learned counsel for the respondent has contended that in the case of a contract of employment same is required to be terminated. It cannot be unilateral action. The factual matrix of the aforesaid decision was totally different. Though the employee had tendered the resignation it had not been accepted on the date on which he filled the nomination form in order to contest an election. In that context, observations have been made. However, it was observed that it would depend upon the phraseology used in a particular provision whether there is a necessity for acceptance or any other formality is required when it could be said person ceases to hold the office. With all fairness, the aforesaid proposition has not been disputed by the learned counsel appearing on behalf of the respondent. In this case, there is no such requirement of acceptance by such an employee under the provisions of the Standing Order 18 read with 17. Thus, the decision in Moti Ram (supra) is not applicable. Resultantly, we allow the appeal. The judgment and order passed by the High Court and the order passed by the respondent declining to accept the resignation are hereby quashed. The benefits which may be available shall be paid to the appellant. Provident fund with the prevailing rate of interest from time to time. The gratuity, if payable or any other benefit, shall be paid with interest @ 6% per annum. Let the outstanding amount, if any, be paid within a period of three months from today. This appeal being similar is also allowed in the same terms of Civil Appeal No.7822 of 2011 decided today. Date : 01-11-2018 These matters were called on for hearing today. For Appellant(s) Mr. Mohan Bir Singh,Adv. For Respondent(s) Mr. Shubha S.Saxena,Adv. Leave granted in SLP (C)No.27941/2017.